This trip is a unique and exciting way to spend the day on the Bay. Spend half the trip catching Maryland famous blue crabs. We use trot lines and “pick up” traps to catch these tasty crustaceans. Everyone will get an opportunity to “run” the traps and “dip” crabs. But watch it – they bite! These crabs are not only fun to catch, but excellent to eat. Spend the second half of your trip catching rockfish, bluefish and perch. Try your luck “jigging” with light tackle or bottom fishing. At times, the action is nonstop. All your fish will be cleaned for you. 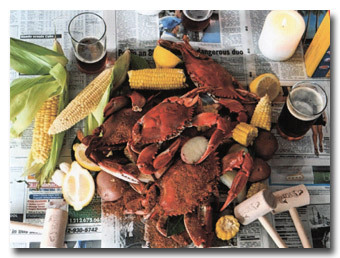 The steamed crabs and fish make this the ultimate Chesapeake Bay Feast. *Fins and claws trips are best scheduled mid-June to the 1st week of October.